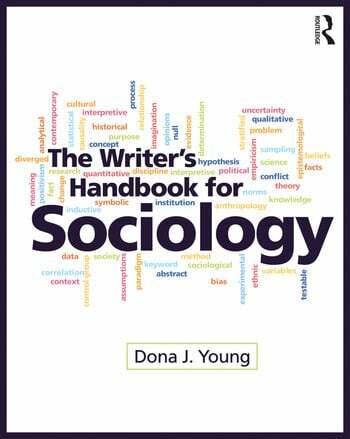 The Writer’s Handbook for Sociology gives students the tools that they need to develop evidence-based writing skills and format academic papers in American Psychological Association (APA) and American Sociological Association (ASA) style. This book helps learners develop a reader-friendly writing style incorporating active voice, parallel structure, and conciseness. In addition, grammar and mechanics are presented in a systematic way to facilitate learning, helping students fill learning gaps. Dona J. Young, MA, teaches professional writing at Indiana University Northwest. She earned an MA in education from The University of Chicago and a BA in sociology from Northern Illinois University. Young believes that writing is a powerful learning tool and that learning shapes our lives; she is also the author of The Writer's Handbook: A Guide for Social Workers, Business English: Writing for the Global Workplace (2008), and Foundations of Business Communication (2006), among others.